Patio umbrellas are extremely useful patio accessories, providing shade from the sun, protection from the rain, and helping to form a comforting little micro-climate underneath their canopy. Whether they are used in conjunction with a patio dining table or on their own, they create visual interest and signify places of serenity. They must, however, be properly weighted down! 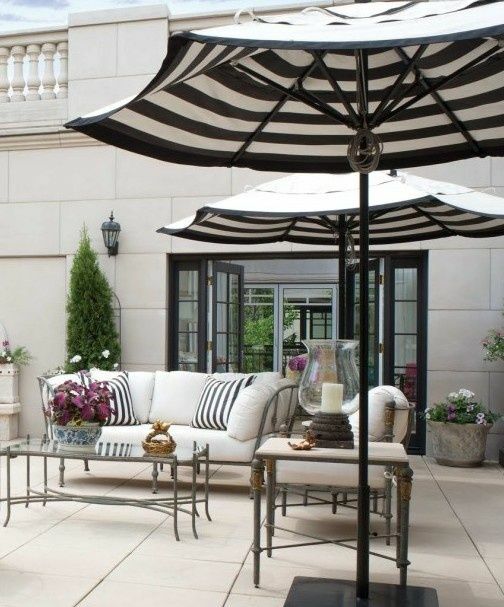 Patio umbrellas vary significantly in price, dimensions, and build qualities, and it can be difficult to figure out the proper market umbrella stand weight to use in different circumstances. Tables provide a second point of support to those umbrellas used in conjunction with a table. This additional support takes some of the emphasis off of the base weight, but these patio umbrellas still need a base weight as well. If the weight is insufficient, the umbrella may take the table down with it — and any dishes or glasses on the table will be shattered! What is a Market Umbrella? Is it Different than a Patio Umbrella? When browsing for umbrellas, you will often find the term “market umbrella” referenced. The term market umbrella is an industry term and is often used without reference to what a market umbrella exactly is. So what is a market umbrella? And what is a patio umbrella as well? What is the difference between the two? Often it seems the two are used interchangeably in advertisements and on Pinterest, and it is unclear what the difference is. Hopefully, we can clear that up a bit here. [Read more…] about What is a Market Umbrella? Is it Different than a Patio Umbrella? Want to Buy a Chiminea, Fire Pit, or Ethanol Fireplace? Looking to bring a fire feature to your backyard or patio, but can’t decide if you want to buy a chiminea, fire pit, or ethanol fireplace? Here is the ultimate guide that goes over all of your outdoor fireplace questions! Outdoor fireplaces are a wonderful attraction on chilly fall evenings. They bring heat, light, and a heartening warmth to those in their midst. There is something magical about watching flickering flames. Being by a fire with friends and family brings a deep connection that virtually all of humanity shares. The ability to cook can be helpful, and even simply roasting marshmallows can be a rewarding experience! Backyard fireplaces help to extend the useful length of time one can use a yard or patio space, because it can be quite comfortable sitting outside by a fire, even on a chilly evening. These units can be an excellent compliment to grilling and can help keep a backyard party or event going long into the night. There are several different styles of outdoor fireplace heating units, and this guide covers all the details on the major types of fireplace units: chimineas (or chimeneas), fire pits, and bio-ethanol fireplaces. [Read more…] about Want to Buy a Chiminea, Fire Pit, or Ethanol Fireplace? A beautiful, modern shaded patio. Source: Home Design Etc. Proper shading is a crucial element to creating a pleasing outdoor environment. It is easy to neglect to shade a backyard or patio space, and it is often easier to just grab something quick and functional rather than taking time to find the right shade objects, ones that are beautiful, functional, and that contribute to magical, modern outdoor environments. For those of us who live in and around cities, on small parcels of land with tiny outdoor spaces, it is crucial to maximize every square inch of land and to supply as much privacy as possible while making the outdoor space feel more expansive than it really is. 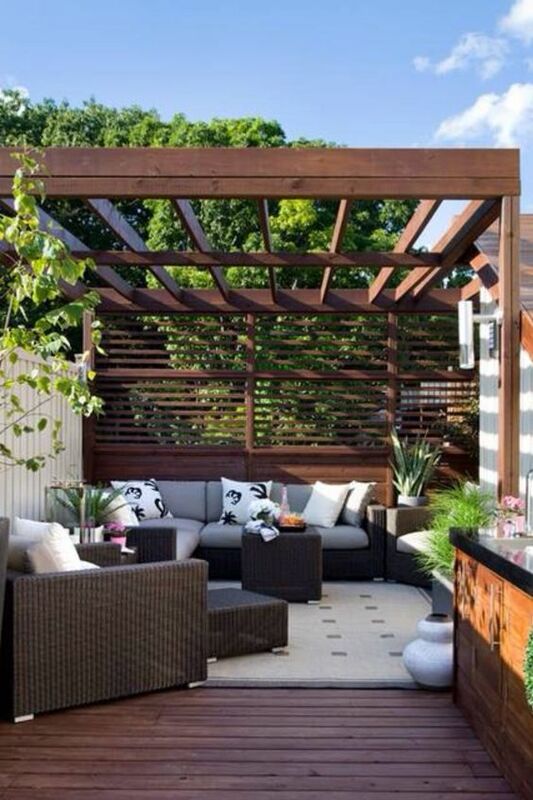 Considering the outdoor space both horizontally and vertically is key to getting the most out of your outdoor area. Shade sails can be the final little touch that makes a backyard patio into a truly amazing space, the roof to your ideal outdoor room. Patio shade sails provide shelter from the sun and bring an unparalleled vertical presence and beauty to your backyard decor. The practicality of installing patio sail(s) in various configurations is an important aspect to consider, as each backyard has a different working environment for the sails to work their magic. This patio shade sail installation guide will hopefully help get you set up and properly shaded! For the most part, installation of a shade sail is relatively straightforward, but of course, each individual unit is installed differently, so we encourage you to read the specific instructions of your unit. This guide will give you a general idea of how it all works in various environs.